What better way to feel your mother's warmth than to make a quilt out of her sarees? My mother is not fond of cotton sarees, like many people she feels that wearing it makes her to look fat. But it is inevitable in coastal Karnataka in hot summers. Old cotton sarees are in great demand in my native village. People there always want old cotton sarees, not to wear them but to sleep in them and mostly to make diapers for the new born babies. I had couple of my mother's old torn sarees and one of mine. So I thought why not make a quilt out of it. For this quilt I used three sarees, old duppatta, cotton threads. Lay down two of the sarees and thoroughly press them so that there are no folds. This also helps in stitching. Use the less torn one/ good looking one out side. Just put the second saree inside the first one. Since the saree is too long, I didn't want the whole 5 m+, so I cut it to the required length. In this case I cut out the pallu part. Use running stich along the width of the sarees to stitch them together. 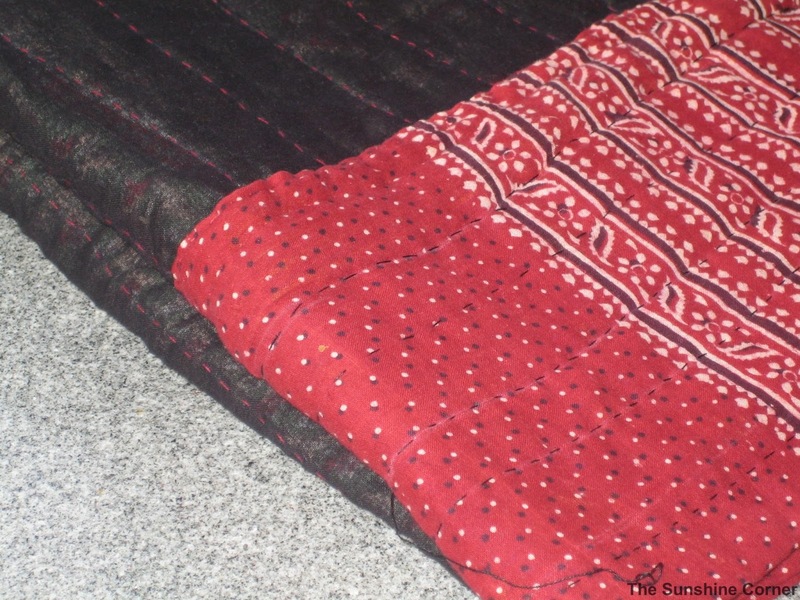 Here you can see a saree inside and outside of which you can see a balck saree with red border. After stitching the above, I had to give them a border for two reasons. 1. I did n't like the uncomfortable zari border. 2. I wanted extra width to the normal saree width. For this I had an old dupatta. So I cut it into half, made the two layers of the third saree(exactly of the same lengh and width of the dupatta) and stitched it as a border. It almost took me a week, to stitch everything by hand. Thnaks for sharing blog on Cotton Sarees .